I like that these Minions from Skinner and Lulubell Toys are exactly what minions should look like. Evil little creatures who do the bidding of bigger evil creatures who can't be bothered with the minutia of their misdeeds. They should not look like giant goggle wearing Tic-Tacs who speak nonsense and frequently adorn the t-shirts of people arrested inside of Wal Mart. They really give people who want to become minions an unrealistic expectation of what their future will look like, and I won't stand for the children of this world being misled about their career choices. 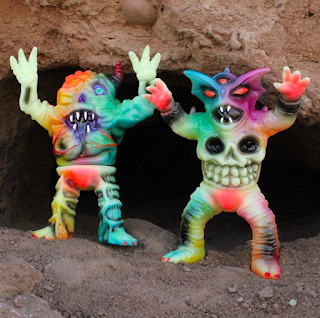 One look at this colorful crew and you know they are up to no good. They've got their hands up, ready to bring bad guy stuff down hard on anyone who gets in their way. Do I have a favorite of the two? Yes, but that's just to inspire them to work really hard to take that top spot that they don't know they already aren't in. You don't learn management skills like that from reading a book; it only comes from getting other people to do the stuff at work you don't have time for. 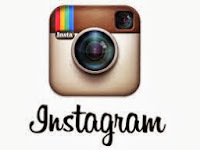 Which is pretty much anything that doesn't involve me checking my Instagram activity. 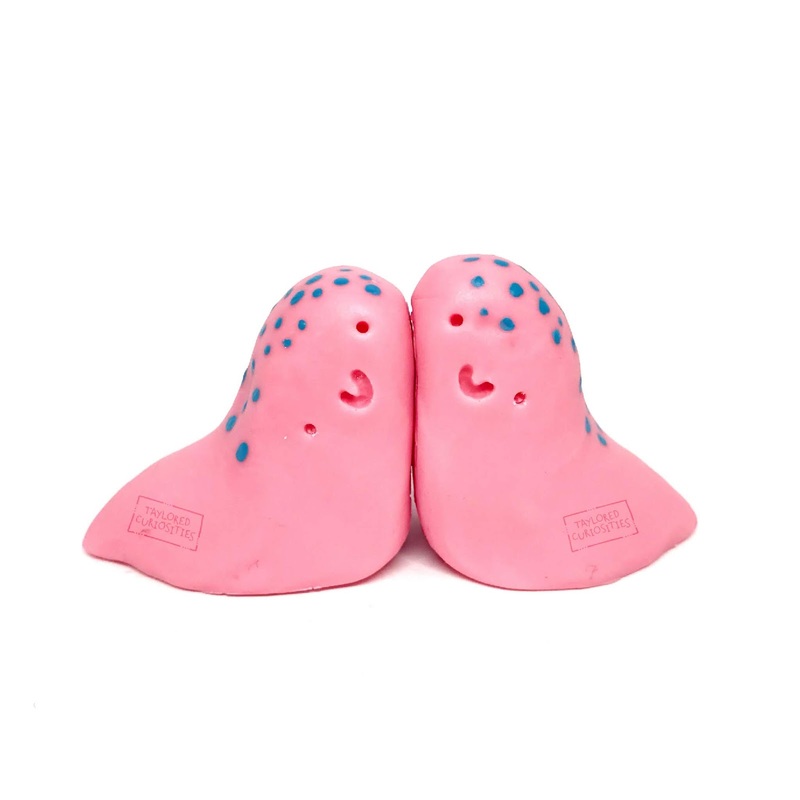 This dynamic duo will be available starting today (Thursday, February 28th) at 10am Pacific time only from www.lulubelltoys.com. Each set is $80 plus shipping. The toy you see above took a whopping four years to produce. Four years!!!! People think toy making is as easy as when they solve crimes on CSI by throwing all the evidence into a super computer, press a few buttons, and are magically taken to the suspect's Facebook page. Like wine, whiskey, and corpses (wait, what?) it takes time for the stank of genius to marinate and the results, as you can see, are spectacular. 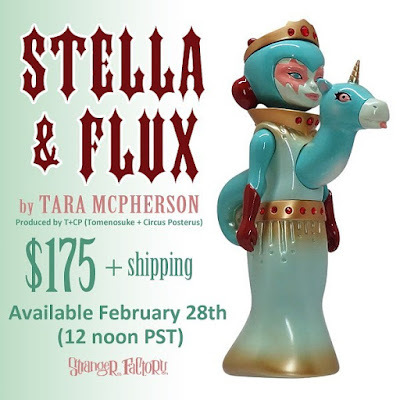 This figure looks like it jumped straight out of a Tara McPherson painting and that's because of the hard work of Circus Posterus and Tomenosuke. Every detail is spot on and if you could come any closer to matching her signature color palette your name would be Gandalf and you'd be a dang gone wizard. 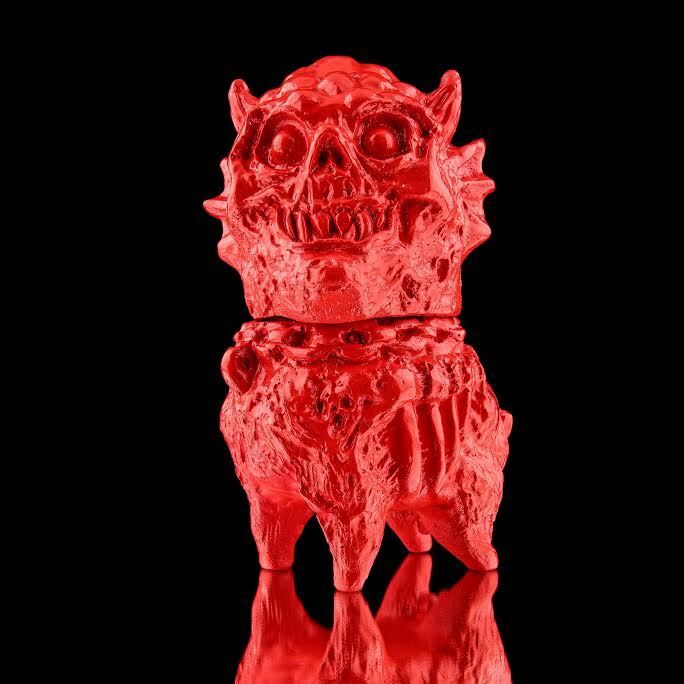 To top it all off this is made in the most luxurious plastic known to man: pure Japanese sofubi. I get the tingles just thinking about it. The photo above kinda gives away how you can get one, but I'll reiterate for those of you I've lost along the way with my nonsense. This nearly nine inch tall beauty will be available beginning tomorrow (Thursday, February 28th) at noon pacific time from www.circusposterus.com. Now that is only if you live in the United States or Canada. 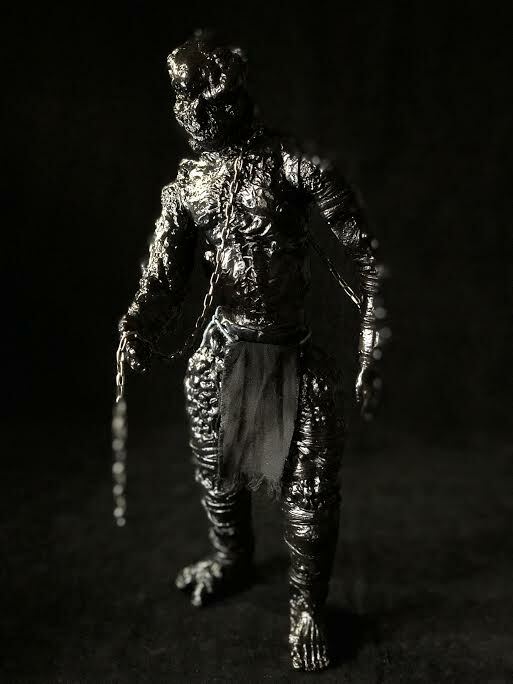 If you happen to find out that you live anywhere else in the world, you'll have to purchase your figure from www.tomenosuke.com. Check your passport if you have any doubts. PS: I mean, this figure is really amazing, isn't it? 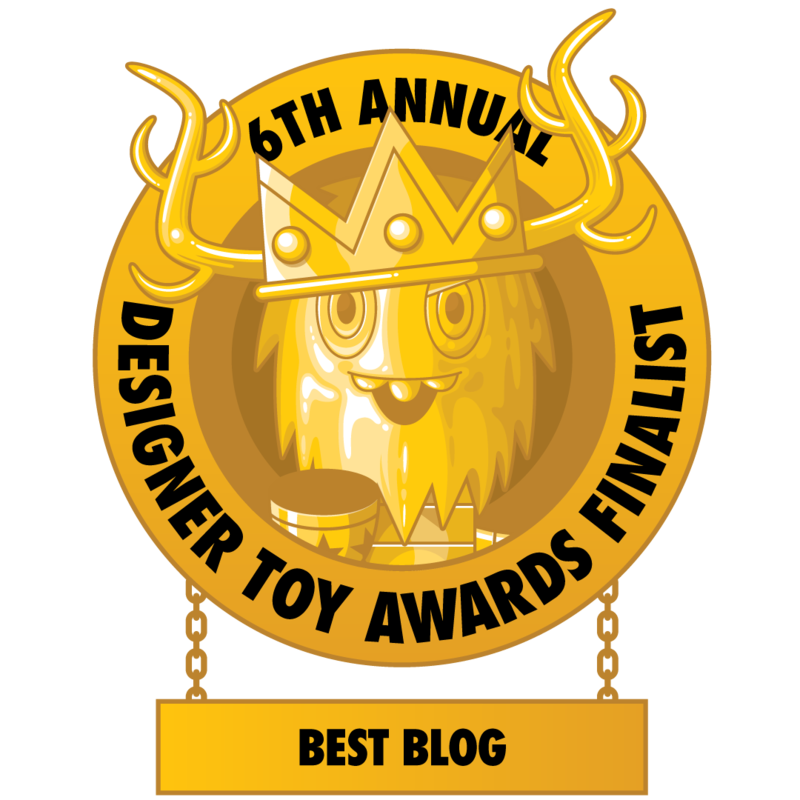 You don't get to use the word "gorgeous" when describing toys very often, but it would be entirely appropriate here. Anyone that is #blessed enough to work with the public more than likely feels a little stabby on a daily basis. Feeling stabby means that you get the notion, should you be able to get away with it free and clear, that you would like to cut someone with a bladed instrument. Through countless hours of research that have all been detrimental to my stability, I have determined that 1 in every 3 people is both crazy and unreasonable. No matter what you do for them, no matter the rules you break or the lengths you go, your encounter with them will chip away at your very being. I'd love to give you a specific example but I've been advised by my health care professional to try and let go of past trauma. 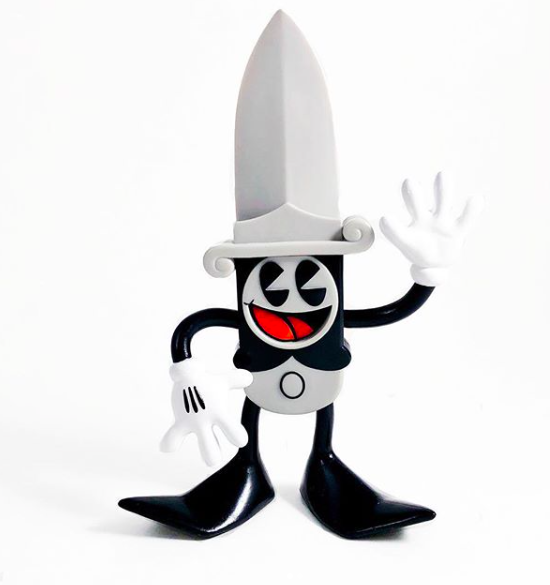 This little dude looks like he would try and convince you to stab people regardless of the consequences. He'd maintain that devilish grin while espousing the benefits of attempted murder. He is the creation of on Greg "Craola" Simkins and 3DRetro has brought him to life in vinyl toy form. Available starting today, February 20th, at noon pacific time, this limited edition weapon of minor destruction can be yours for only $50. 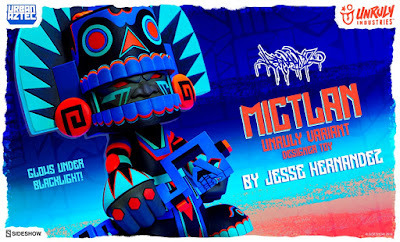 Get Stabby by visiting www.3dretro.com. Most of us will never get the chance for a second appearance after we are ushered into the after life by the God of Death. This world will be but a distant memory as we cross over to what lies beyond. Rising from the grave hasn't been made to look like an attractive proposal by Hollywood, but not all of those who come back are doomed to stumble around like its the parking lot after a Judas Priest concert. 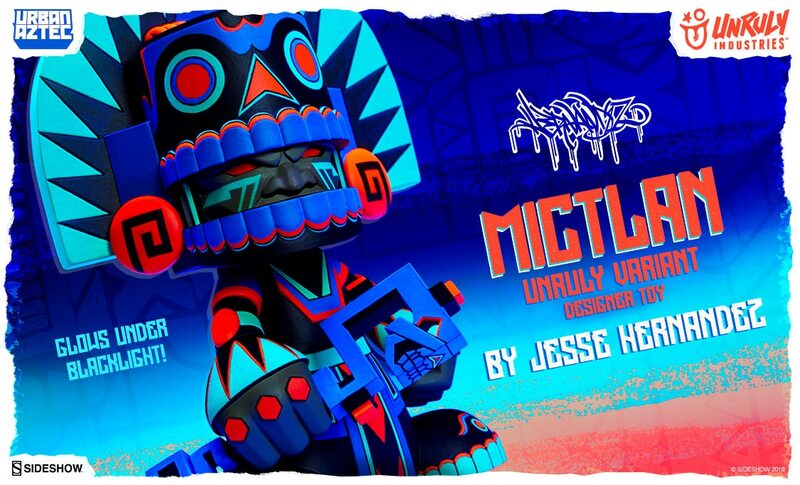 Jesse Hernandez's Mictlan figure has lived one life before, but now with the help of Unruly Industries this Aztec reaper has reentered our world. 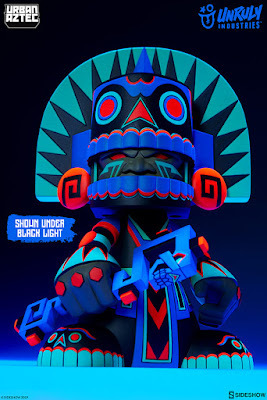 This vinyl figure is decked out in a blacklight reactive color scheme that is poised to trip you out while you're sampling grandma's glaucoma medication. 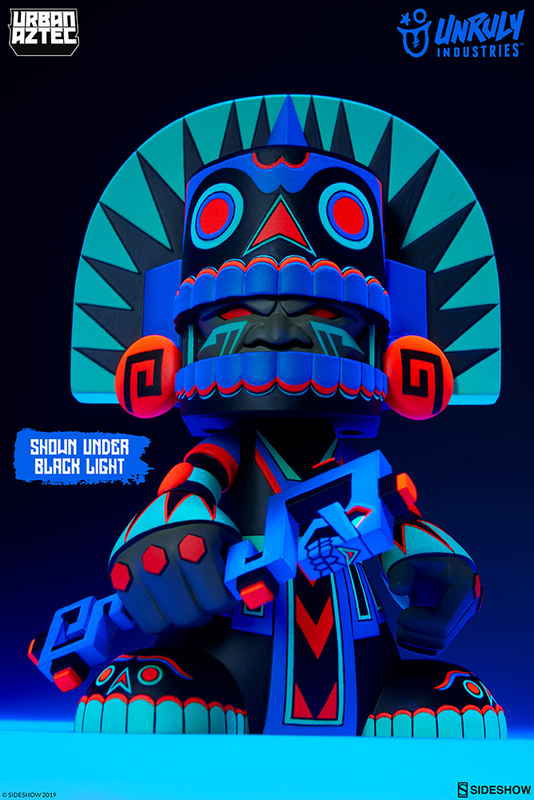 Standing at six inches tall this vinyl figure is limited to 750 pieces and available now by checking out this link. Super7 is killiiiiiiiiiiiing me with their Reaction figure line. 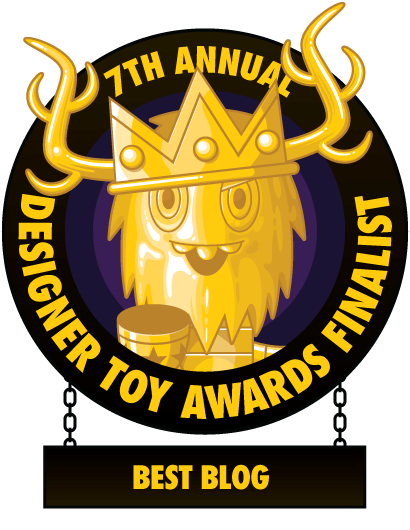 The designer toy world has largely ignored music licensing for some reason, but thankfully someone has picked up the slack and gotten really creative with it. 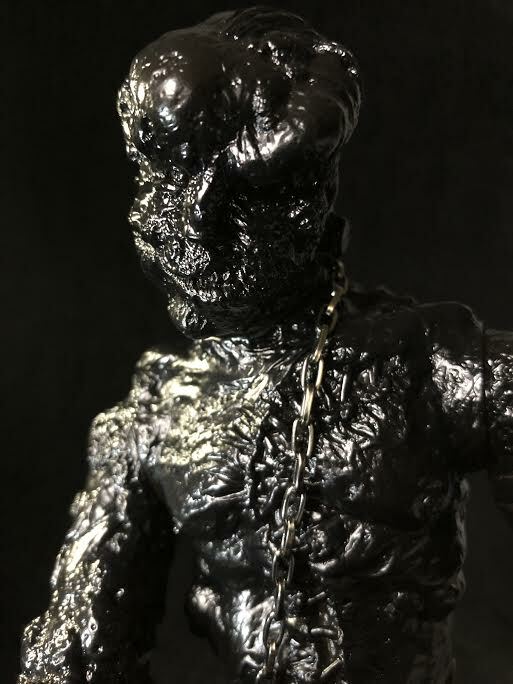 I've seen Slayer more than I've seen anyone other than Marilyn Manson so you better believe I lost my mind when I saw this figure pop up on Instagram today. 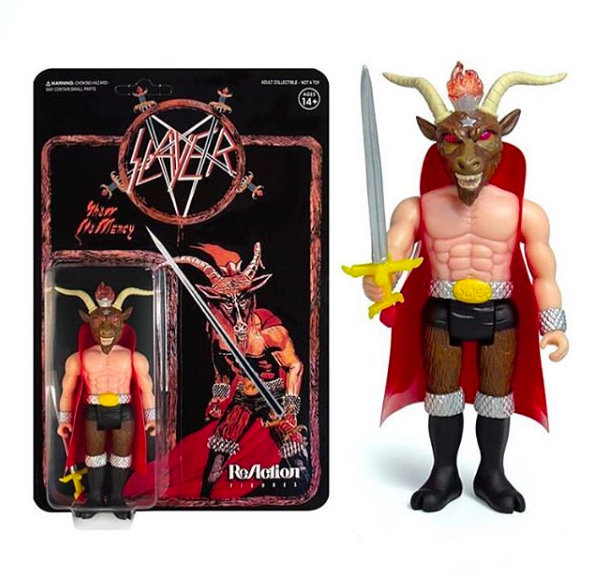 It features the minotaur character from their debut album in classic action figure scale and the cover artwork as the card backing. This is obviously a case of buy one figure to open and buy one to keep in the package as you'll need one to set up crazy photoshoots with the rest of your collection. GI Joe has no idea what's coming for them. 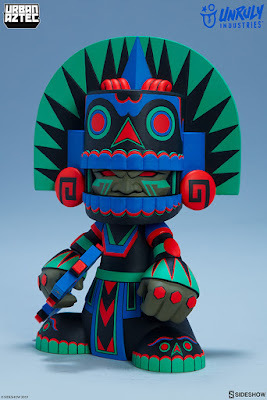 These will be up for sale beginning next Wednesday, February 13th, at www.super7.com and their retail locations in San Francisco and San Diego. The kid I went to middle school with who refused to talk to anyone but literally had every Slayer shirt ever printed is probably really excited right now.